South and North Kinsman are located on the Kinsman Ridge Trail high above Franconia Notch. North Kinsman Summit is viewless but there is a great outlook near the summit with fantastic views down to Franconia Notch and across to the Franconia Ridge. South Kinsman Summit is an open summit with excellent 360 degree views. From the west (Route 116) the summits can be reached by taking the Mount Kinsman Trail then heading south on the Kinsman Ridge Trail. 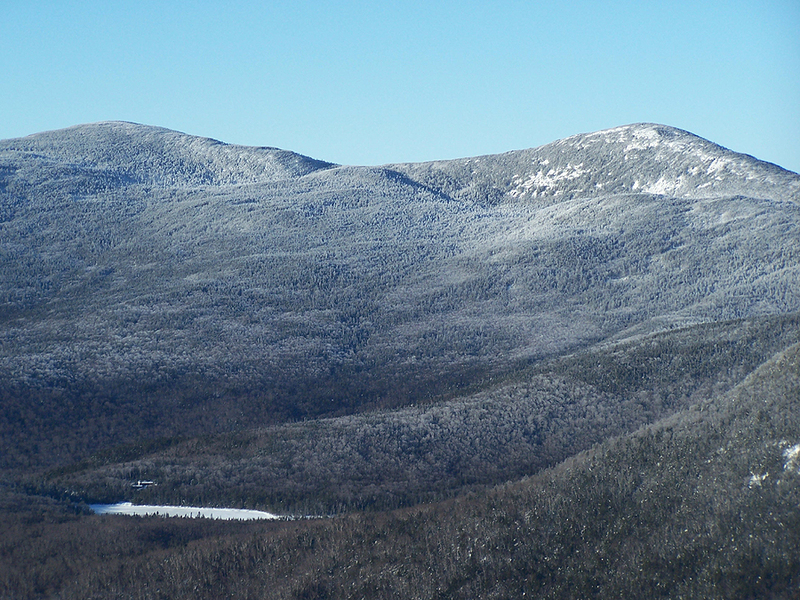 From the east (Franconia Notch) the summits can be reached by taking the Lonesome Lake Trail, Fishin' Jimmy Trail, then heading south on the Kinsman Ridge Trail, or by taking the Cascade Brook Trail, Kinsman Pond Trail, then heading south on the Kinsman Ridge Trail. The Kinsman Ridge Trail approaching the summit of South Kinsman is exposed and can be difficult and dangerous in bad conditions. -Lonesome Lake, Fishin' Jimmy, Kinsman Ridge Trail: 4.9 miles, 3,500 elevation gain. Lonesome Lake Trail head is located at the Lafayette Campground and has very good footing with easy grades and is a great beginners hike that takes you around Lonesome Lake and to the Lonesome Lake Hut. Fishin' Jimmy Trail starts out with decent footing and moderate grades but soon becomes steep with rough and rugged footing with some pretty interesting wooden steps to help negotiate through the steepest sections. The Kinsman Ridge Trail over to North and South Kinsman is well marked, has decent footing, with moderate grades.